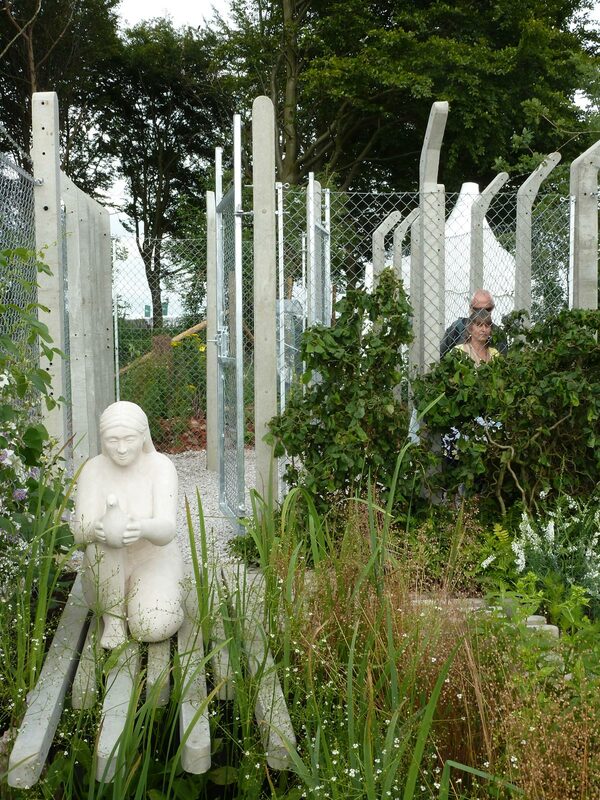 Community was important in the two previous show gardens, involving a large team of experts and volunteers – the Quaker Concern for the Abolition of Torture (Q-CAT) garden will be no exception. 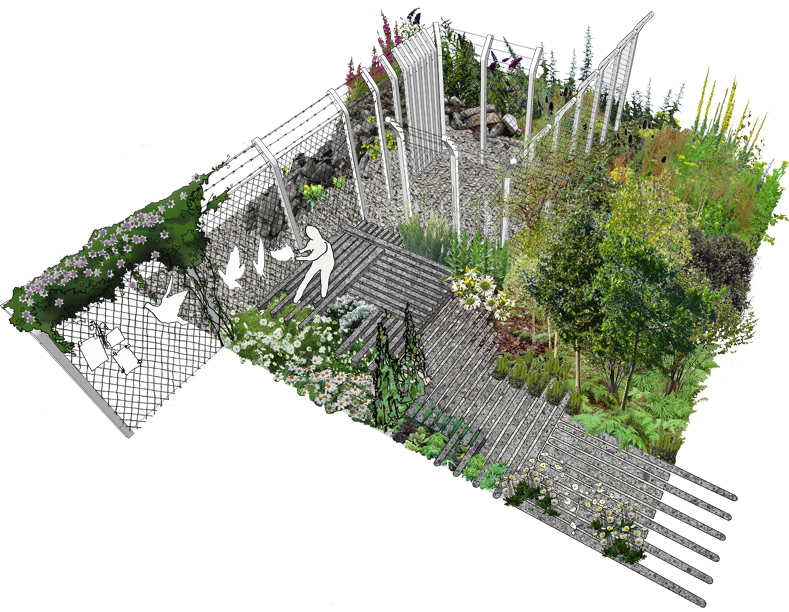 The visitor may enter the garden via a walkway bounded by high security fencing and land devastated by bombing. They skirt the back of a cell and enter it through a prison gate. They can, if they choose, listen to stories of victims of torture on quiet speakers, but are free to walk past these if they prefer. The visitor exits the cell through a second prison gate, into a cultivated garden planted with white varieties of plants introduced by Quakers. This underlines the desire of Q-CAT to end torture, as well as the therapeutic benefit of a beautiful, peaceful garden. A sculpture of a figure releasing a dove sits outside the cell and further doves, made of ‘Lace Fence’, take off in flight across the chain link, providing a visual metaphor for Q-CAT’s hopes for a world without torture. Now the concrete security posts become hard landscaping that is trodden underfoot, which suggests the possibility of overcoming torture. Around the cell is an ecological succession. The bombed area is quickly colonised by willowherbs and Buddleia, followed by more varieties of annual weeds, then slower growing species such as dock and clovers, together with saplings of birch, sycamore, hazel and oak, until it becomes a stand of oak woodland, showing how, in time, badly damaged land can heal itself.